So two posts in one. The Methven Branch research is complete and I now have around 500 pages captured to go through for each station on the branch as well as Rakaia. This means I have at least one layout diagram for every station (however I think there is one station I didn't get any diagrams of) and also details of all the bridges on the line (there were actually five, surprisingly, although not all of them still existed when the line closed). 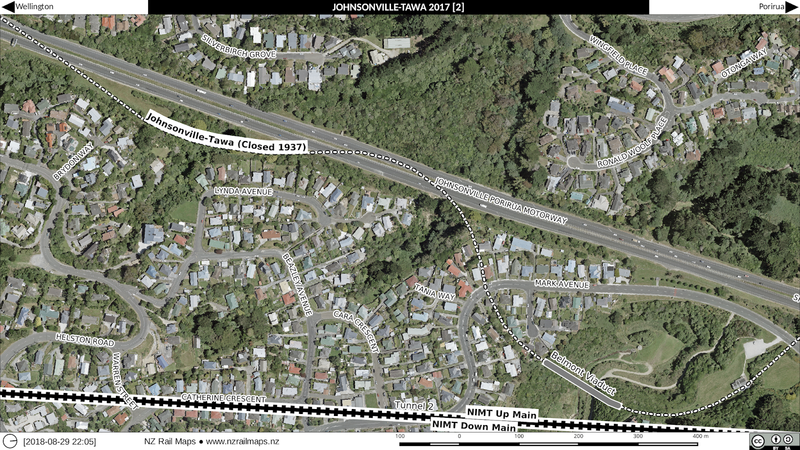 I am not able to directly publish Archives New Zealand material without authorisation so that won't be posted here but I will list some details of the bridges. 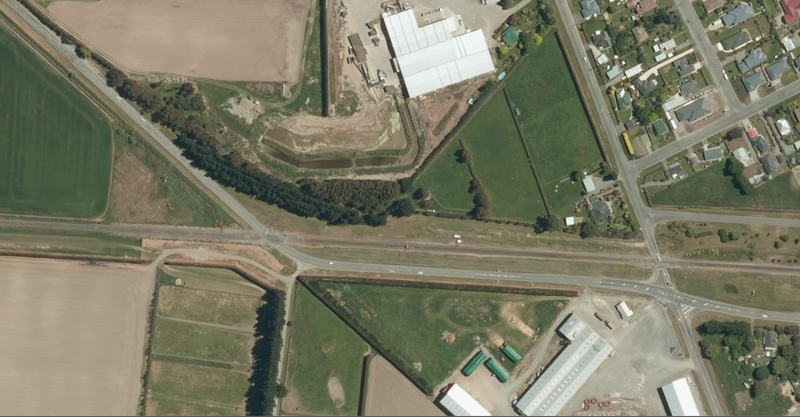 Apart from the five bridges on the Methven Branch I also researched the Rakaia River bridges. 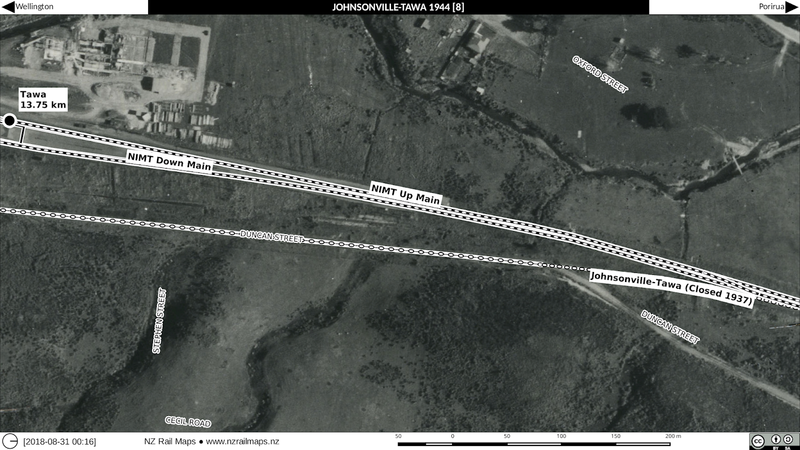 This was originally Bridge 10 on the Main South Line. Today it is numbered Bridge 31, which gives rise to obvious and interesting questions about the basis of numbering of the bridges when it was first constructed. 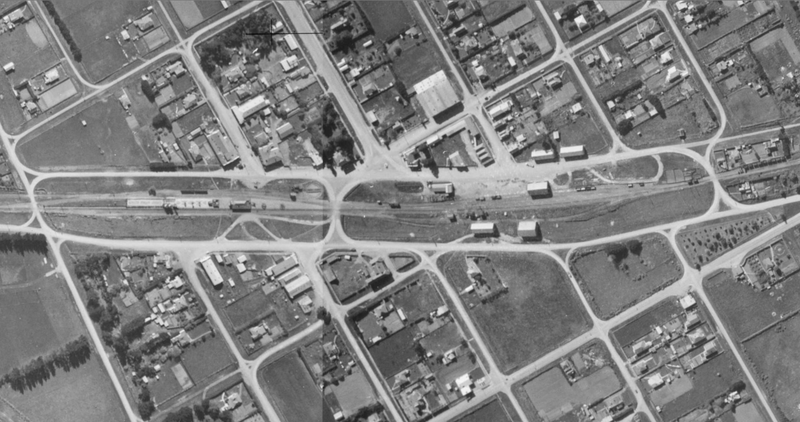 The Main South Line froom Christchurch to the north bank of the Rakaia River was contracted for construction to George Holmes in 1865 with an expected completion of two years. 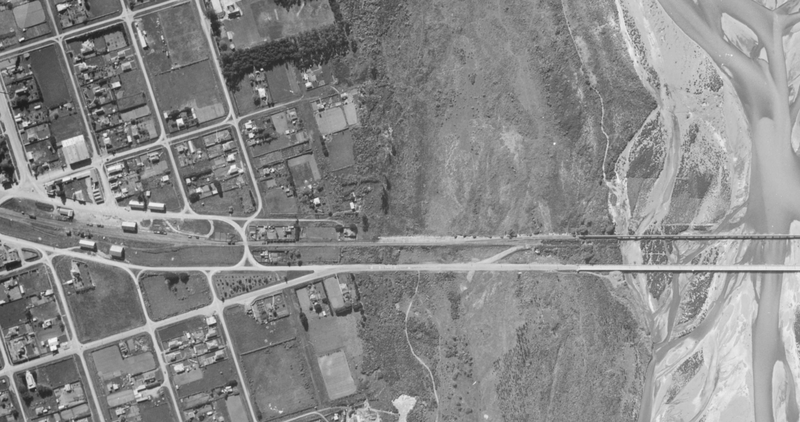 In 1868 the construction of a bridge across the Rakaia River was authorised. Tolls were fixed to be charged to passengers, vehicles and animals. The first estimates by engineers would have put the construction cost as high as 140,000 pounds (about $16 million in today's money). This was regarded as too expensive, but a proposal by William White was accepted and a contract entered into for 21,500 pounds (about $2.5 million) in 1869. This was to be for road traffic only but a conversion to a combined structure to also carry rail traffic was subsequently performed at an additional 13000 pounds. 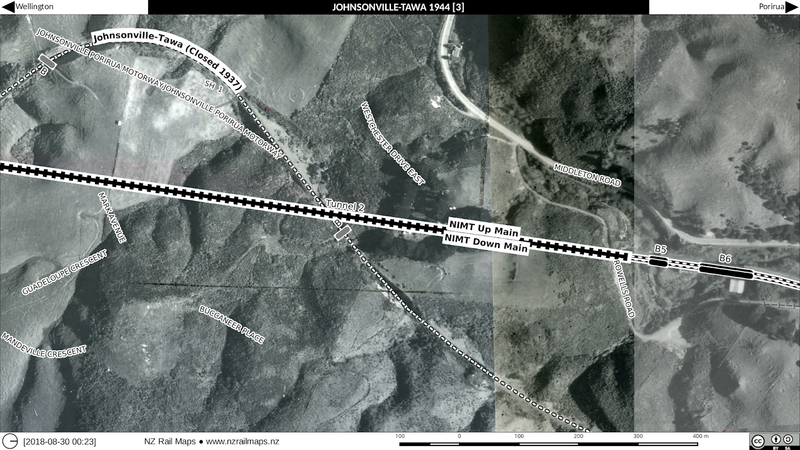 This required extra piles, girders and planking, and additional length of some 480 feet (4480 total). Timber for the original structure was obtained from Little River and barged across Lakes Forsyth and Ellesmere. The bridge finally opened for traffic in 1873. 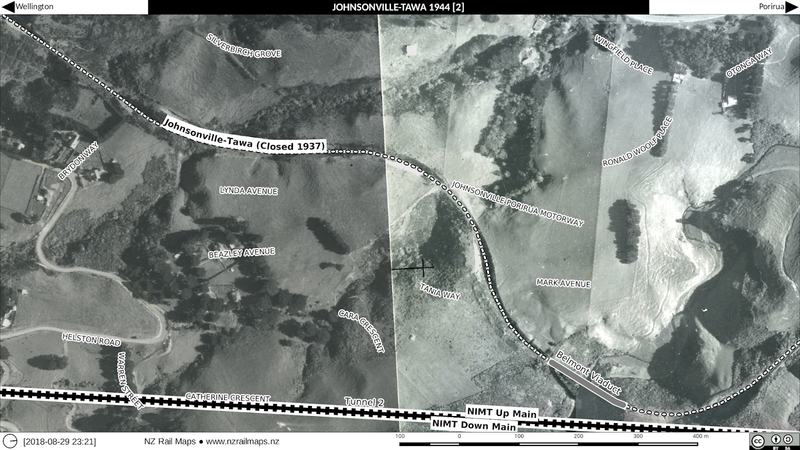 In 1882 the bridge was further extended in length to 5927 feet. Bridgekeepers were appointed to control traffic and signal trains from the outset, but originally only covered the busiest part of a day's operations. During the unattended period trains were still run across the bridge and it was not unknown for a train to have to stop partway across owing to oncoming vehicles; the latter had to be reversed off as the train had priority. In later years additional bridgekeepers were employed to ensure all train operations were carried out while they were on duty. The bridge was damaged by fire on a few occasions and pipes ran along the structure carrying water for firefighting, these were kept full during the summer months but had to be drained in winter. The bridge did not have the flush decking as we would see it on the few combined bridges still used in NZ. Instead the decking consisted of transverse pieces inserted between the railway sleepers to give a continuous running surface, above which the rails stood proud. Vehicles had to straddle one rail and it was difficult for two vehicles to pass on the narrow bridge. NZR staff were kept busy dealing with vehicle damage to the gates and other parts of the structures, and collisions, breakdowns and other causes of delay. 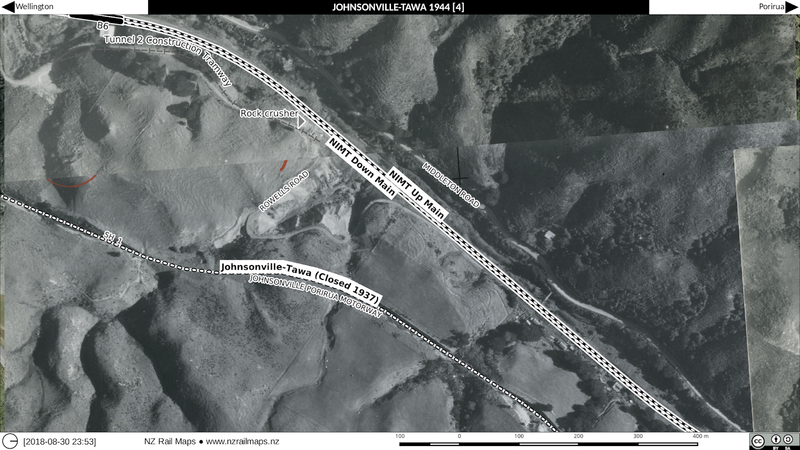 In the early 1930s NZR assessed that the bridge would need major rebuilding and developed proposals for a replacement. 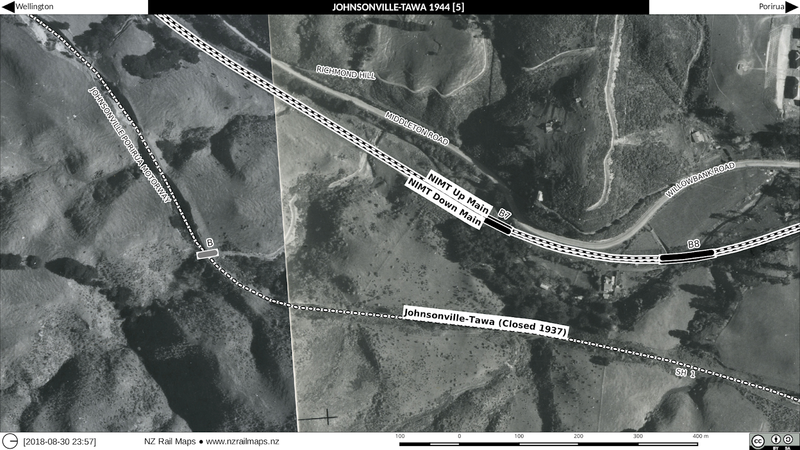 Work to construct this began about 1936 and it was built one chain upstream from the combined bridge. 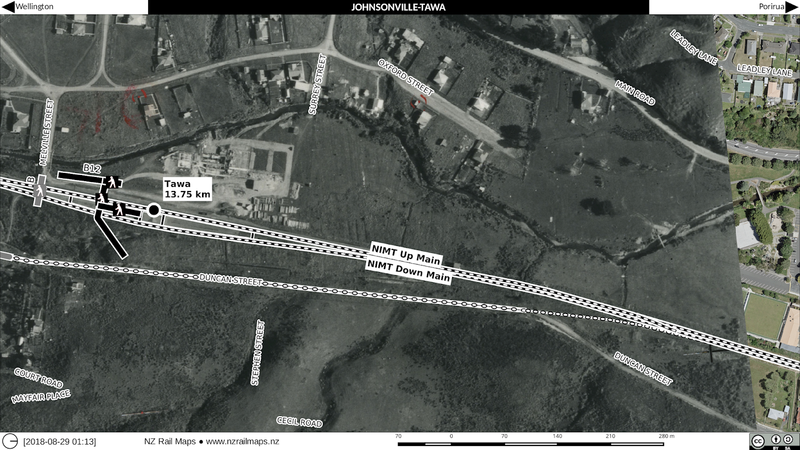 The Main Highways Board had earlier considered purchasing the old bridge and converting it to road only, but eventually decided that a new traffic bridge was warranted and work began on this structure two chains downstream. 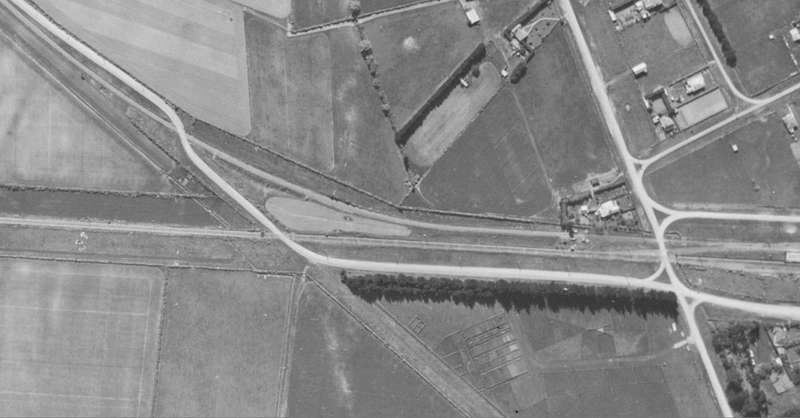 The highway bridge was opened to traffic in March 1939 and the old bridge simultaneously closed thereto. 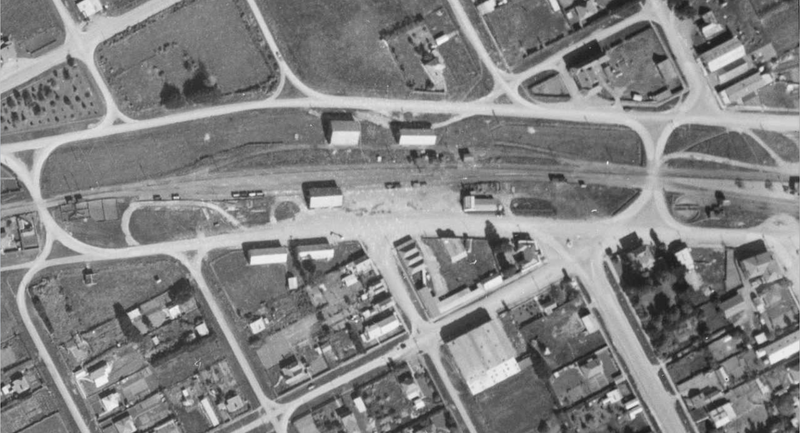 The overhead bridge at the north end was still under construction at the time and was not completed until some months later. The railway bridge concrete piers were let out to contract by the Rope Construction Co whilst the steel spans were constructed at Addington Railway Workshops and lifted into position by NZR steam cranes. 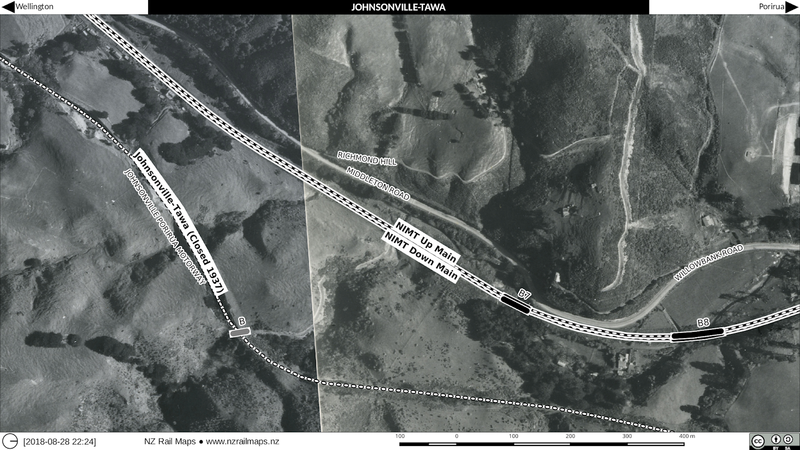 The new rail bridge was 2 yards higher to allow increased flood flow capacity. It came into use in December 1939. 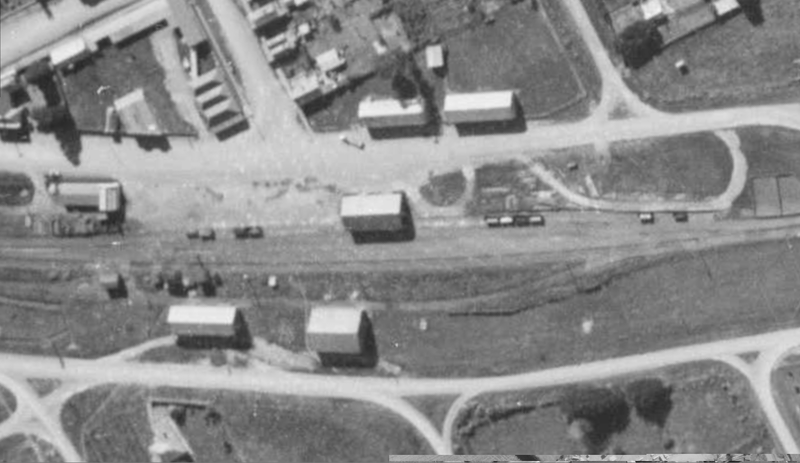 In January 1940 a tablet locked siding was connected at the south end to enable the old bridge to be dismantled. It is not clear whether this was part of the original track onto the bridge, or whether there were still rails on the bridge itself. 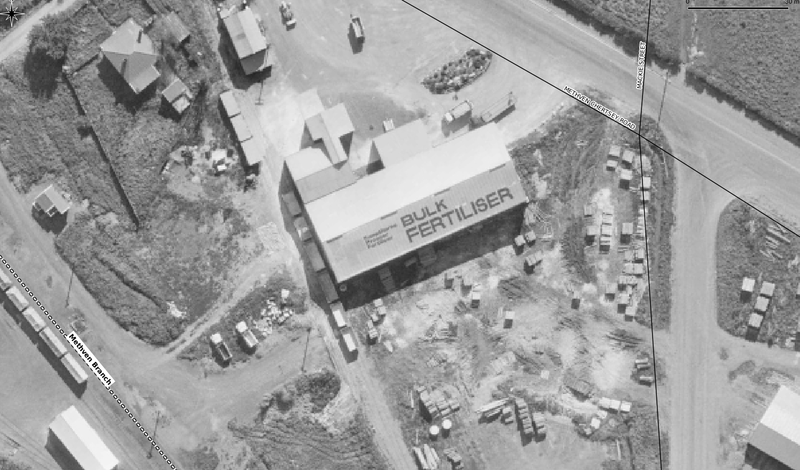 Historically a service siding existed at the north end and during the construction of the new bridge a siding there was in use for equipment and supplies. 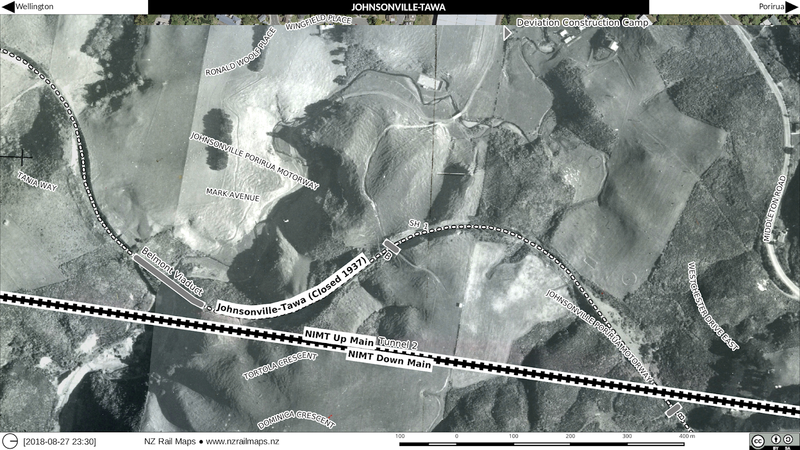 The total cost of the two new bridges was around 150,000 pounds (about $15 million in 2018 dollars). They are each around 5720 feet long or about 200 feet shorter than their predecessor. 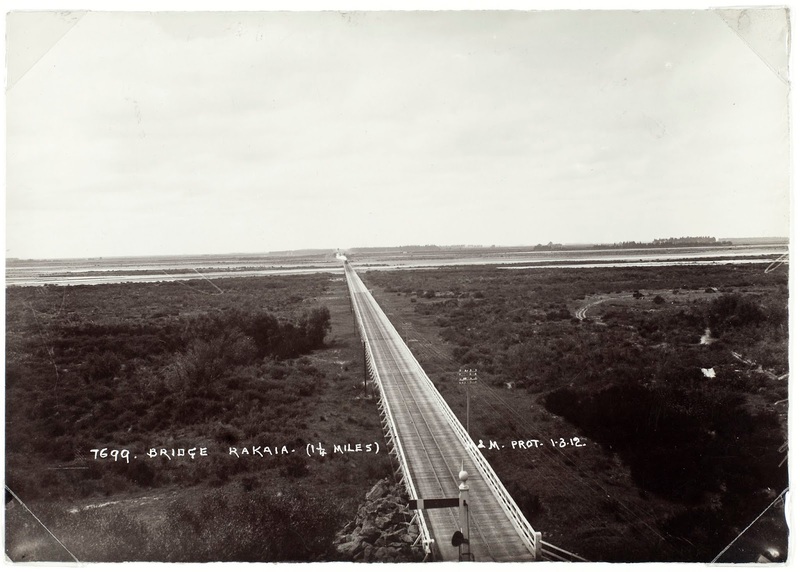 The combined bridge as seen in a Muir & Moodie photo of 1912 (Te Papa Collections). 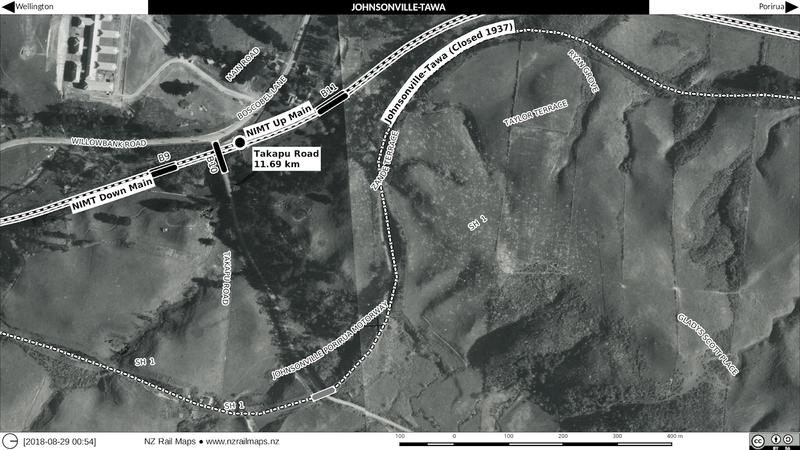 Bridge 4: Dry Creek 13m 62ch / 21.8049 km - replaced washout in 1884 with 5 spans of 15 feet each. 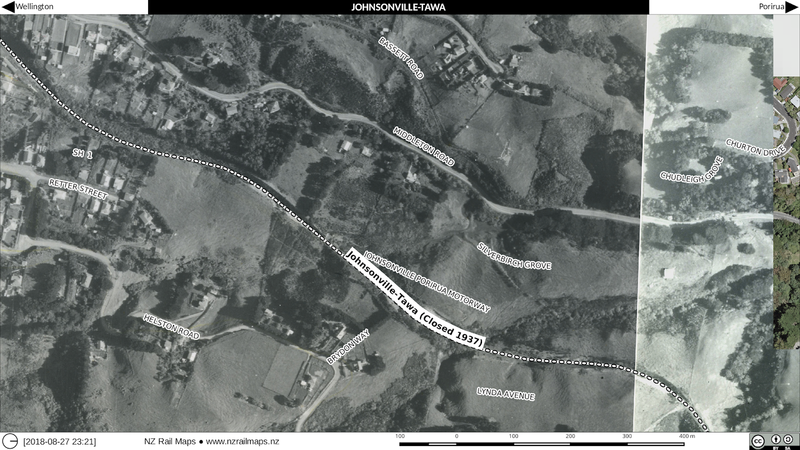 The Dry Creek flood flow was diverted in the 1970s and the outline of this watercourse is now almost impossible to detect on aerial photos. 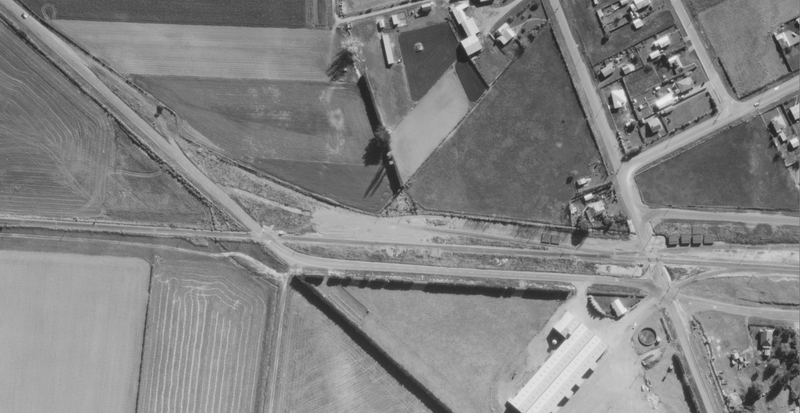 The bridge piers and abutments remain in place today as shown in the Google Earth photo below. The adjacent road still dips through what was an occasional ford. 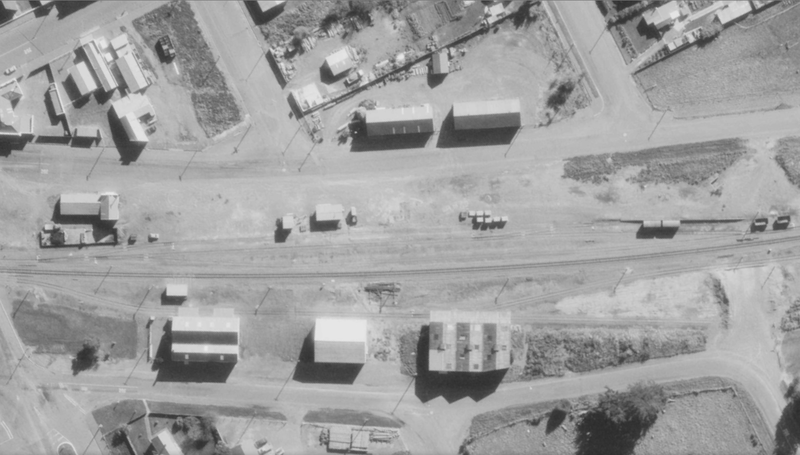 Here is the location shown on a Retrolens photo. 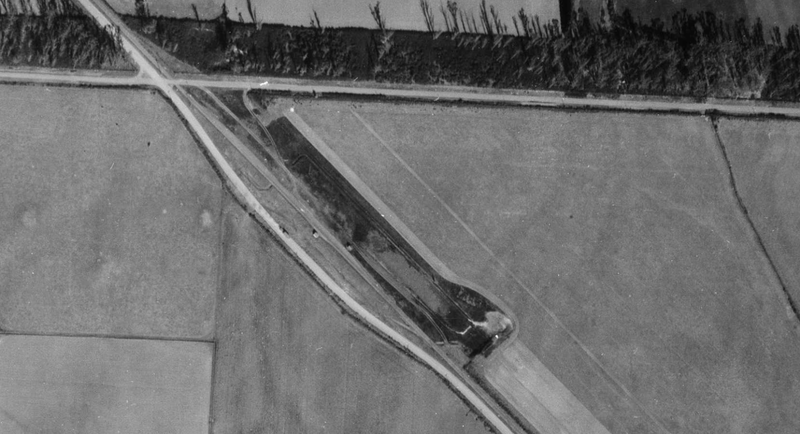 The watercourse is clearly visible in this 1942 aerial. Bridge 2: 3 m 30 ch / 6.7894 km. 2 spans total 27 feet in 1908. 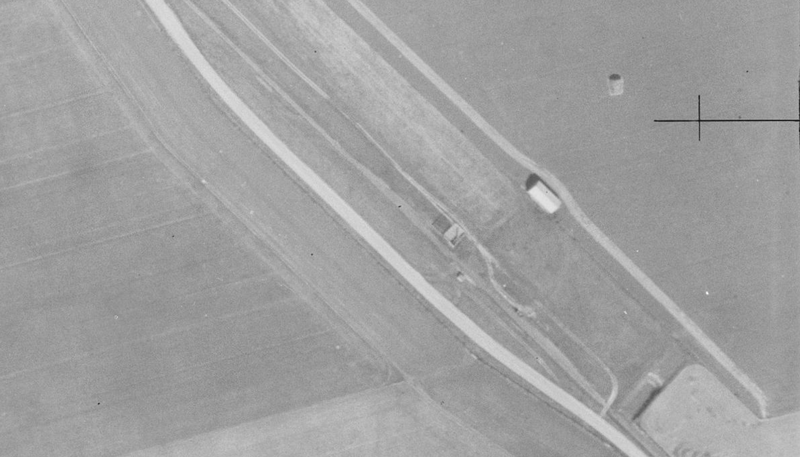 Filled in 1909. 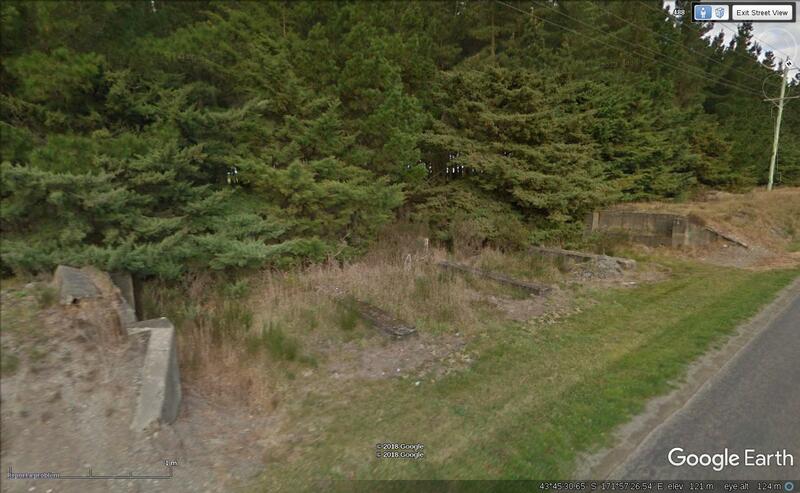 Bridge 1: "3 m 23 ch" (questionable, probably 3 m 2 ch) / 4.9534 km. 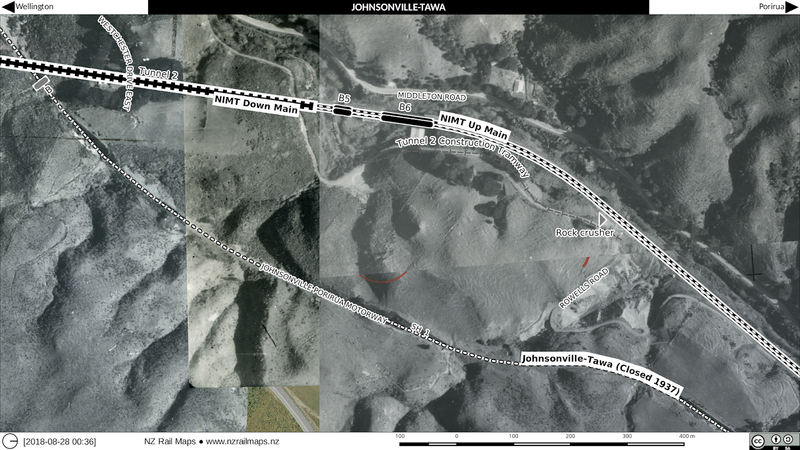 This was the biggest structure on the line, measured at 10 spans totalling 130 feet in 1908. 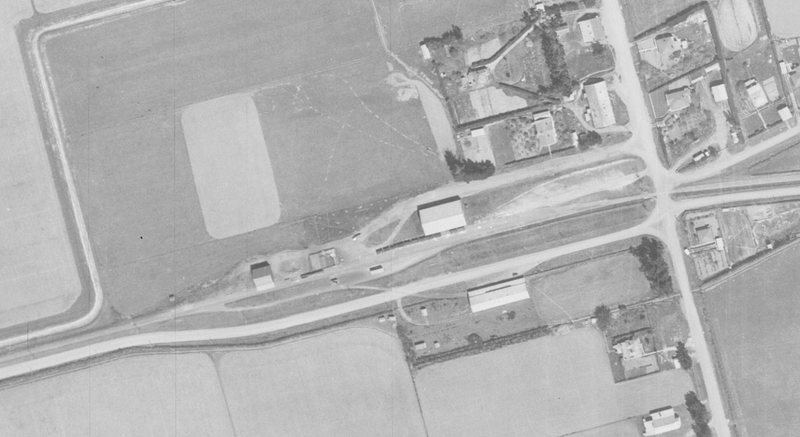 Bridge 3A: 11 m 55 ch. 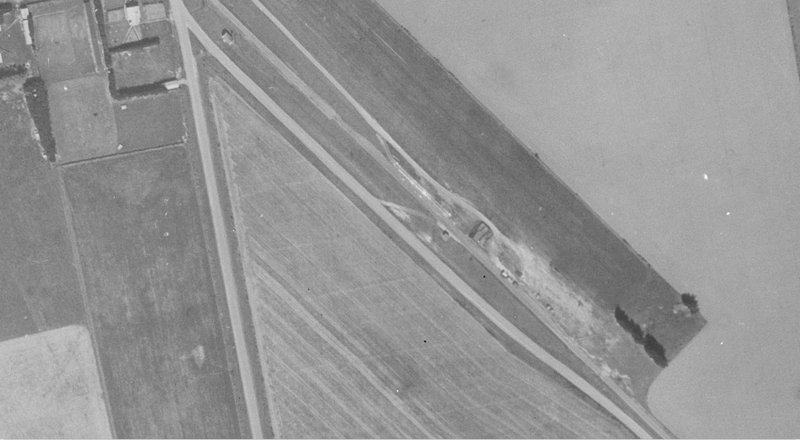 Both 3A and 3 were small structures and I have not recorded any details of them. 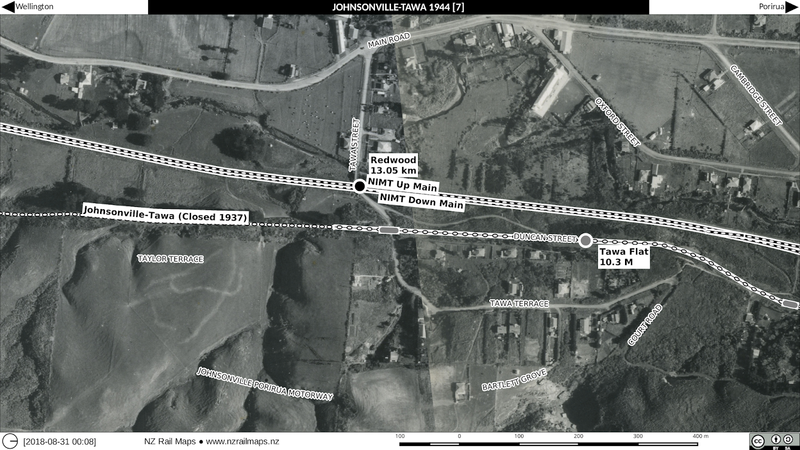 The locations other than Bridge 4 which is a well known location will probably have to be estimated from the nearest station owing to the lack of chainage books in the Archives collection. The other part of this post is about the Springburn Branch which is the other Canterbury branch I intend researching at this stage. I expect there to be considerably fewer files but I could be wrong as I have not yet looked them all up. But I intend to carry out this research in the near future, possibly as early as next week. 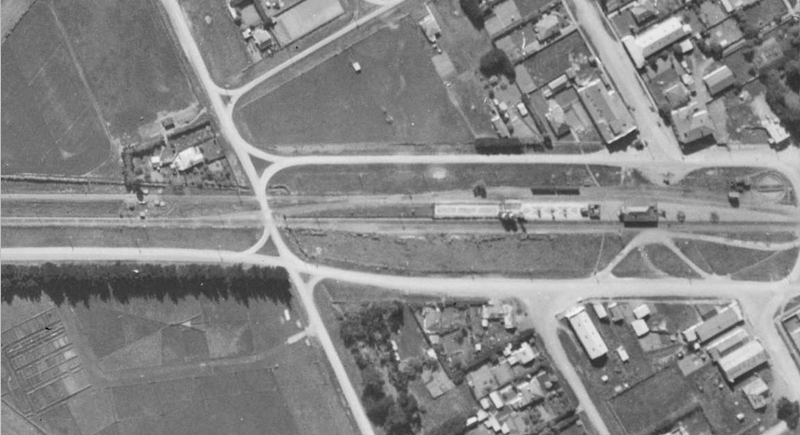 One of the labelled Methven Branch files did in fact contain details of the two bridges that were built around 1940 to cross the Rangitata Diversion Race. I haven't done the photo mosaics yet but have enough Retrolens stuff for them. 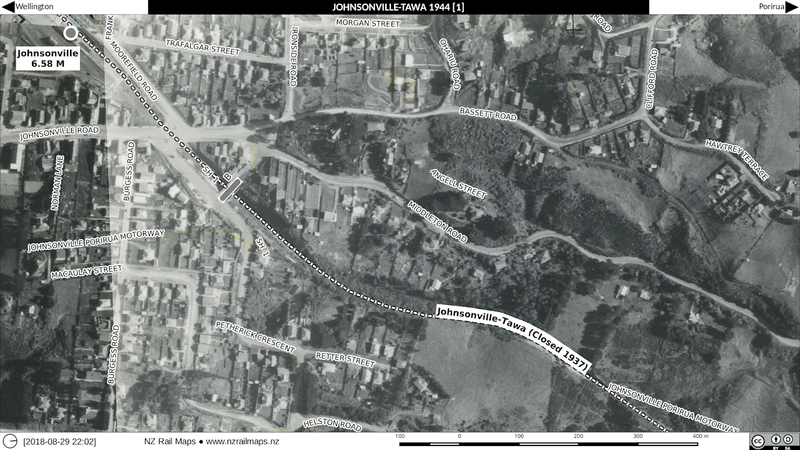 So another set of proofs for the Tawa Historical Society below. Meanwhile everything else is sort of progressing. 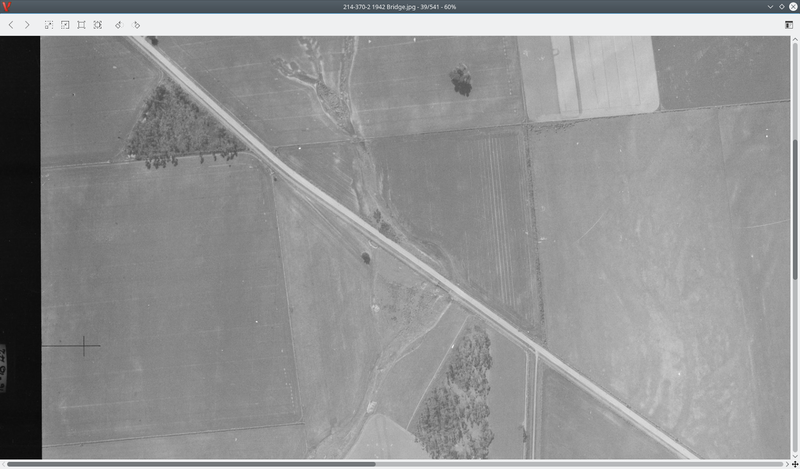 A lot of map drawing time lately has been taken up on researching the Methven Branch. I haven't actually drawn anything for branch maps yet, and I just discovered I need to redo most of the aerial photo mosaics because Gimp defaulted to the lowest quality interpolation setting, so actually mapping the line is still a week or two away. The amount of time it has taken to do the research means I will probably, out of all the other branch lines in Canterbury, only be prepared to add research of the Springburn Branch. 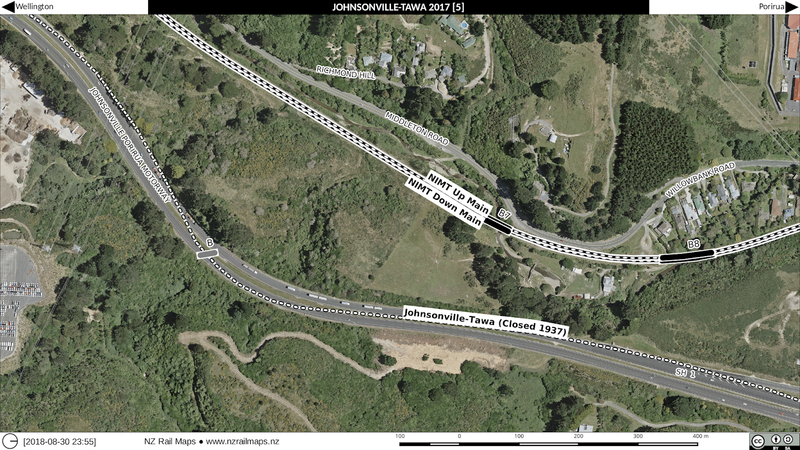 Right now hopefully it will only take one more day on the Methven line, although to be fair that also includes quite a lot of information on Rakaia Junction. 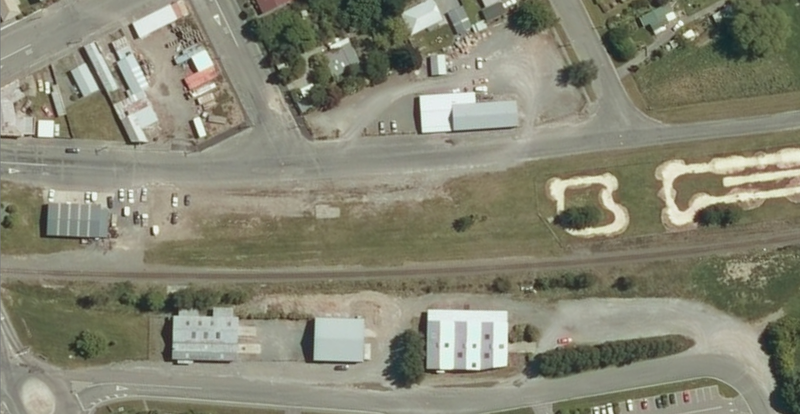 No more work on the Otago Central Railway lately but I am mindful of wanting to get going with that again and I may get something done this weekend. Here is the latest set of proofs for the Tawa Historical Society. I am still in discussion for their exact requirement for their book. 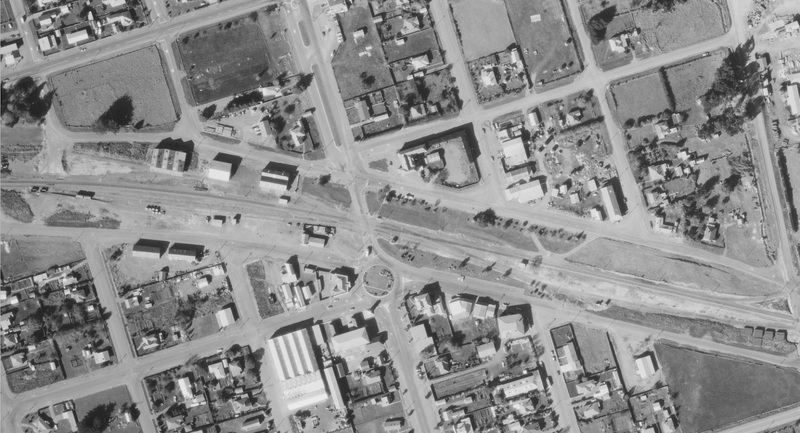 Christchurch City gets covered for rail already, of course, but soon I'll be downloading maps for the entire city, not just for areas around rail lines. 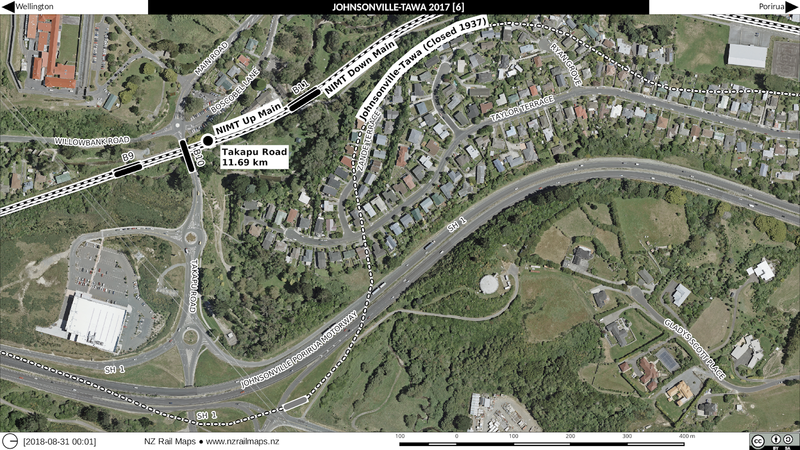 The purpose of these being in order to cover my other transport interests, as I am becoming involved in transport advocacy which covers the entire range of transport networks. This is really just a quick catchup as I have been busy with various things and not much actual map work has been done in the last few days. On Friday morning I had a trip into Christchurch Archives to look at Methven Branch stuff. As they are only open half days and have been since the quakes there is only so much you can get done in 3 1/2 hours, in this case I looked at pretty well all the files for the smaller stations except either end and those two have the most files. In fact I have only seen one quarter so I am guessing at least two more half days and probably more, the ones still to look at have the most detail. That sounds like a lot but it is not so bad to have an interest that gets one out of the house and into the community. 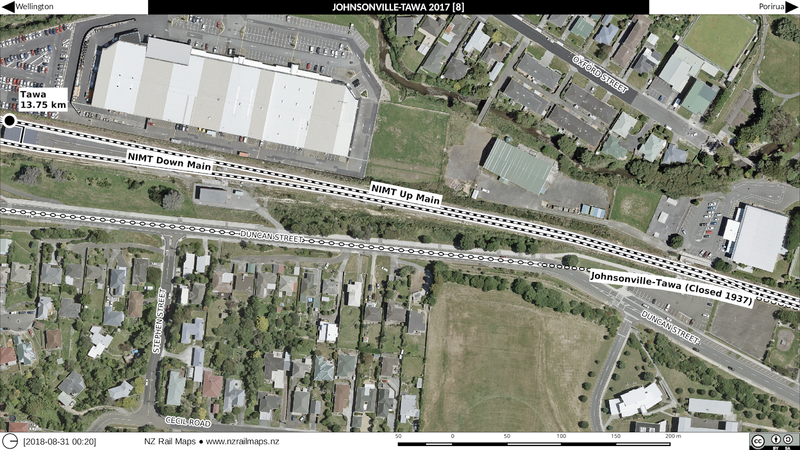 I actually found some other things of general transport interest in the Wigram community which are also relevant so there was some additional benefit from going out there. At any rate I have managed to get useful diagrams for a number of stations but not all of them so some of the maps will be incomplete or guesswork but we will just have to see how that works out. 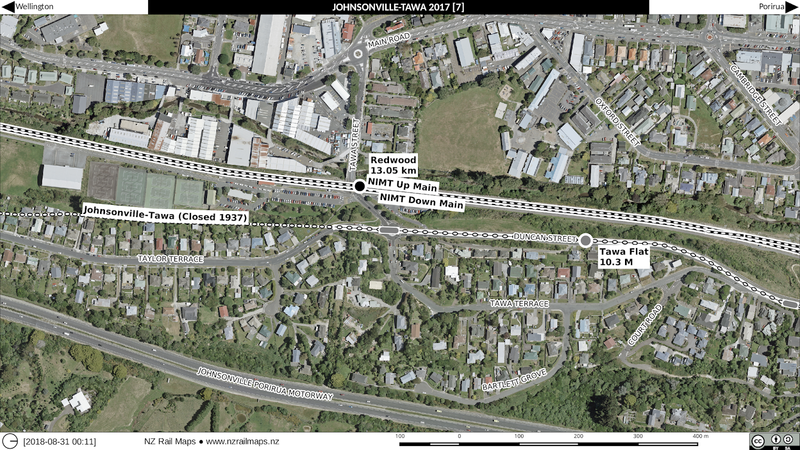 So actual maps of the Methven Branch are still a way off. 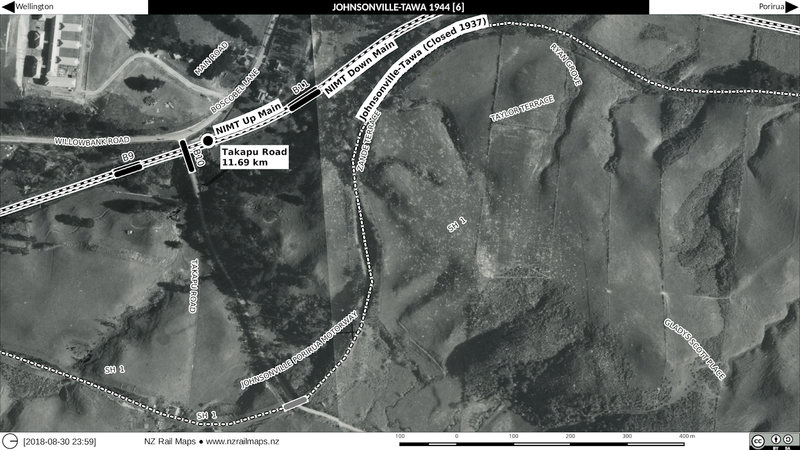 Of higher priority right now is finishing the Johnsonville-Tawa stuff for Tawa Historical Society. I have done some tidying work around the edges of the aerial photos and need to churn out the tiles which I was supposed to do this weekend but it will spill over into next week now but that has to be finished ASAP. On the Otago Central I still have to do the Ida Valley maps which have not progressed since my last posting so there has not been a lot of progress and of course I have to keep at it, at present my timetable is starting to look like it is falling behind. 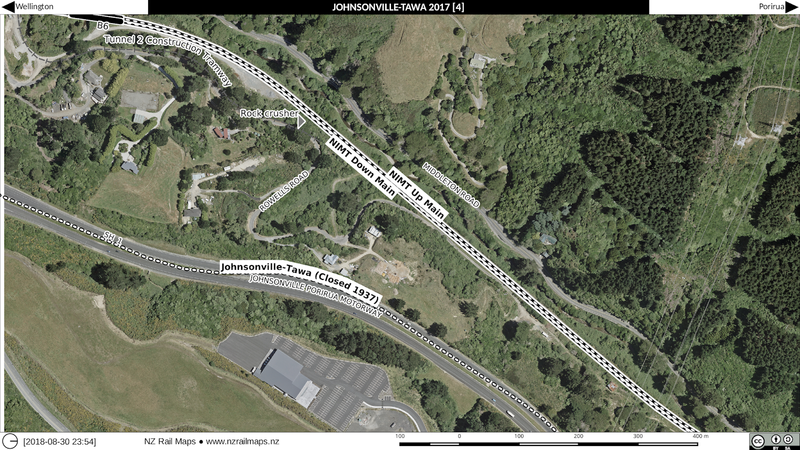 Basically working back from Cromwell (236 km) we have so far got to Ida Valley (157 km) so have covered about 1/3 of the line and about 1/3 of the stations. 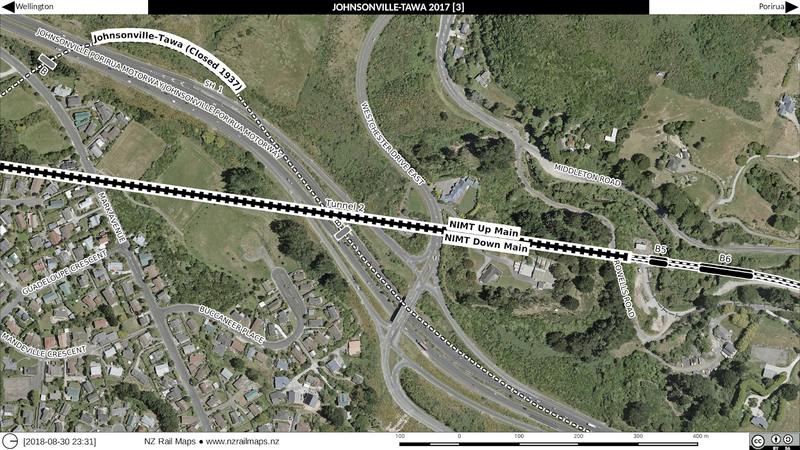 Although many of the Taieri Gorge stations will not get mapped without data for them, so it could cut the number of stations. But as of now it does look like the Otago Central maps won't be finished by the end of the year unless I can totally guarantee to complete a station every week and at the moment this does seem to be proving difficult to keep to, although I also have to spend time on Google Earth checking the streetview between each station which is time consuming so a lot does get done with each map that is not so obvious. 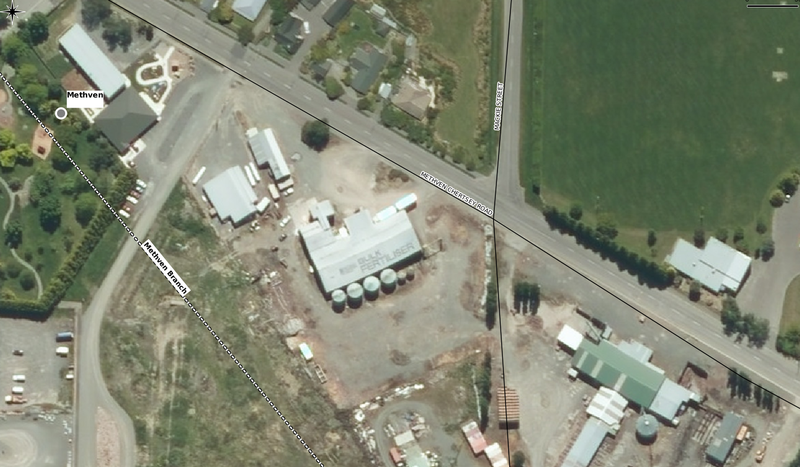 Here is another complete set of pictures of Rakaia. There are three sets in total, from north to south, and in order, each set covers 1942, 1974, 1984 and 2012. 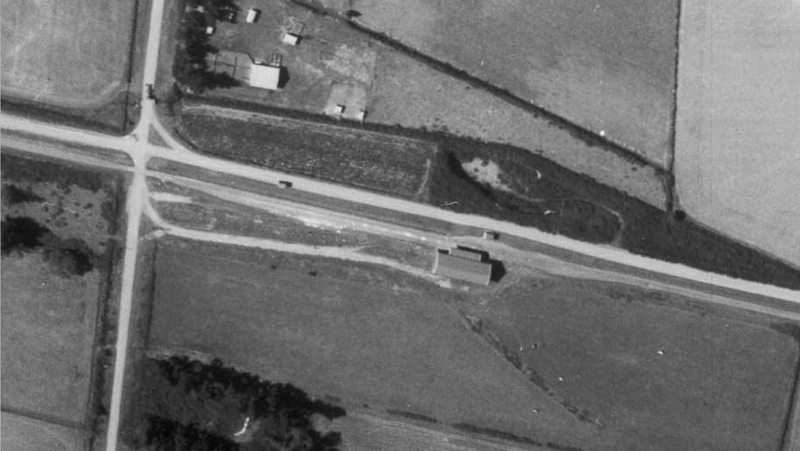 Above is the Rakaia station as seen in 1942. 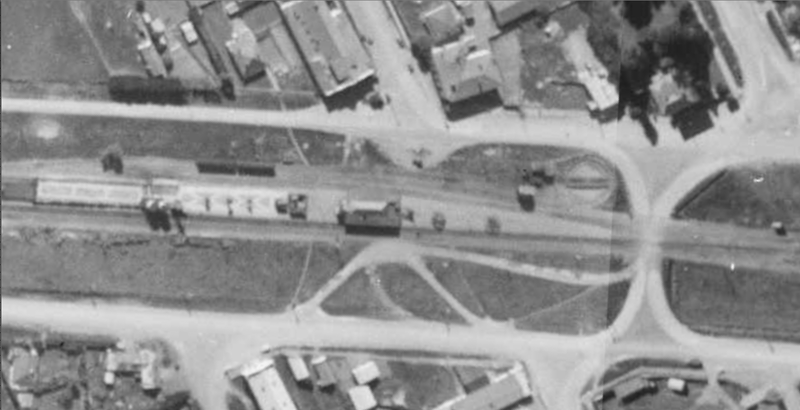 There was a freight yard (to the right) and a passenger platform (to the left). 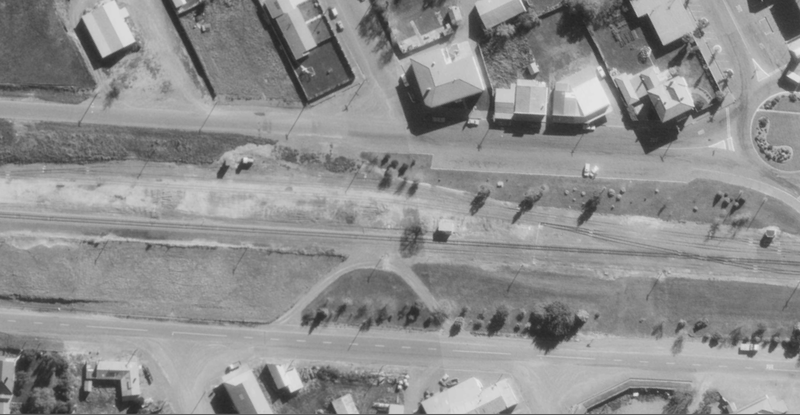 Methven Branch passenger trains left from the western (in this case upper) side of the island platform, while the main line was on the eastern side (lower). 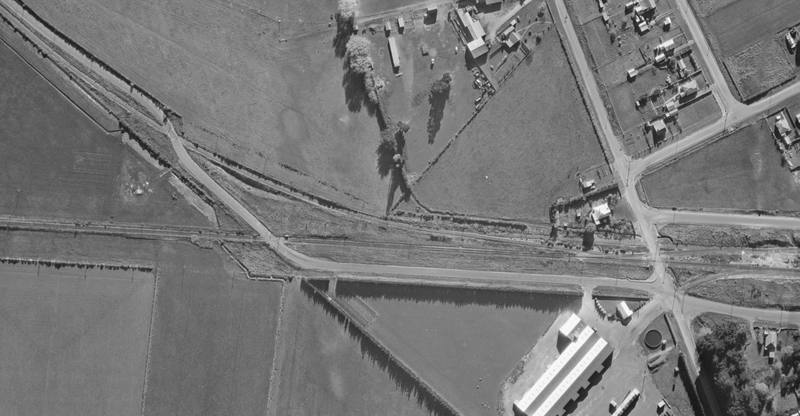 Note the turntable tucked into a corner of the passenger station - Methven had a triangle, so steam engines were able to be turned at each end of trips up the branch. North end of Rakaia and the bridges. 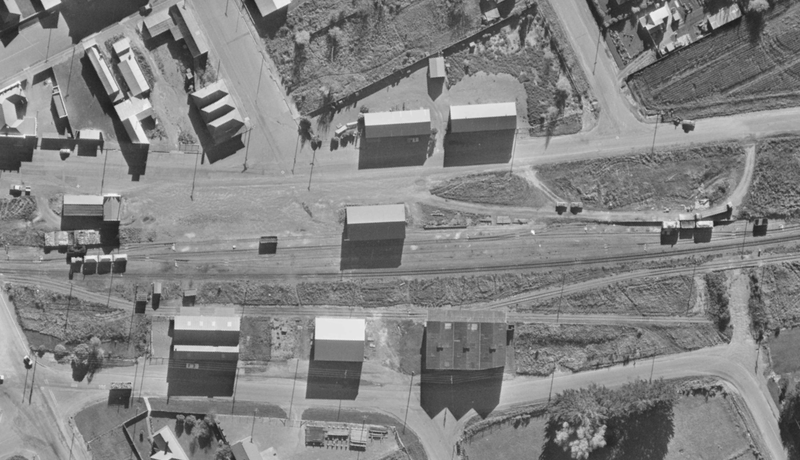 In 1942 the separate road and rail bridges were relatively new. Possibly the white appearance of the road bridge might be down to concrete bridges not being sealed over with tar as they are today. Although this bridge was "state of the art" when built, it is considered narrow by present day standards. 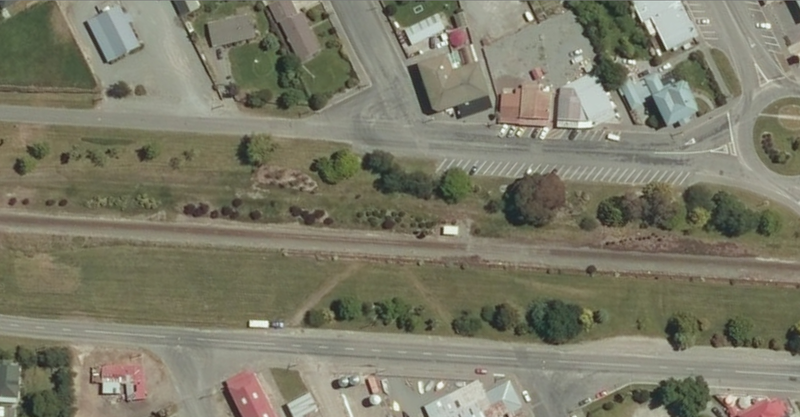 Rakaia Today: Any traces of the railway station and platform are long gone. 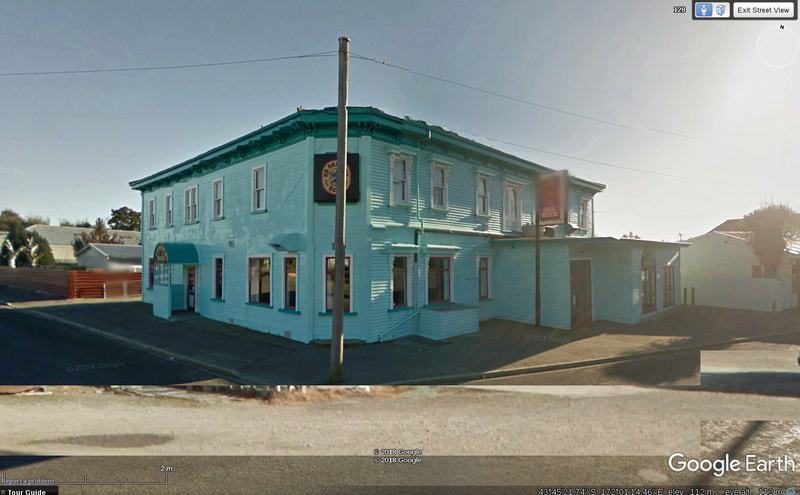 This image from Google Earth is of the Railway Tavern which is directly across the road from the former station in Railway Terrace West. 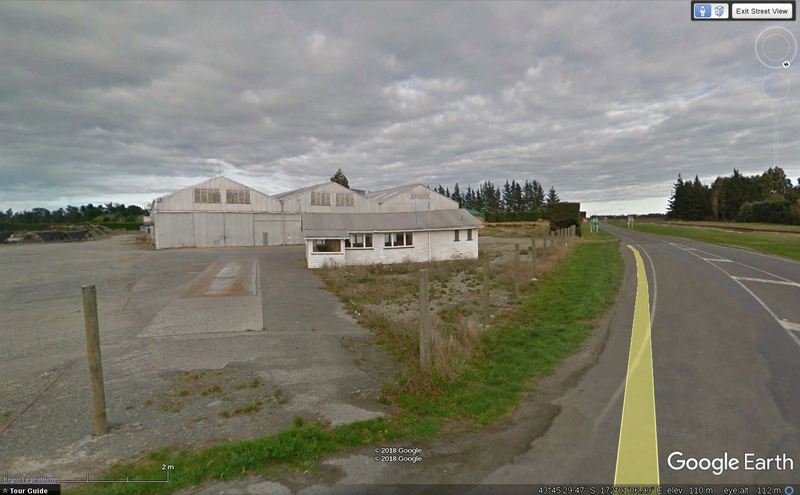 These premises in the south end of Rakaia were among several that were siding served in the days of rail freight. 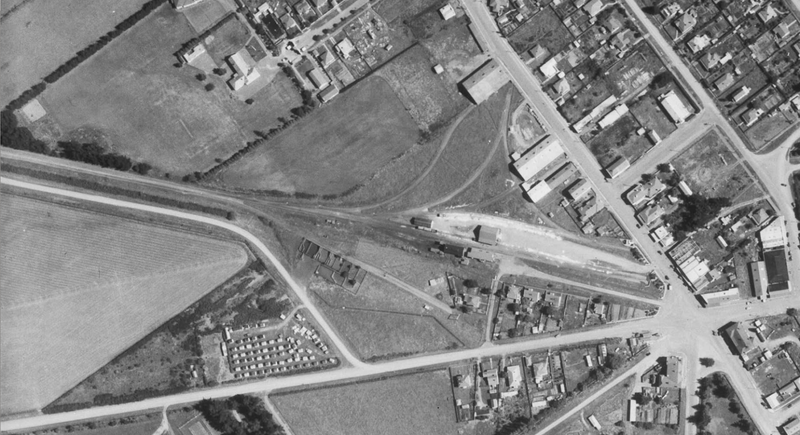 More information on sidings will be shown in due course when the 1974 aerial image tiles for Rakaia are generated and the layout traced, as these particular images are high resolution and therefore well detailed. Apart from the Rakaia map tiles still under preparation, tiles now exist for every one of the branch stations. 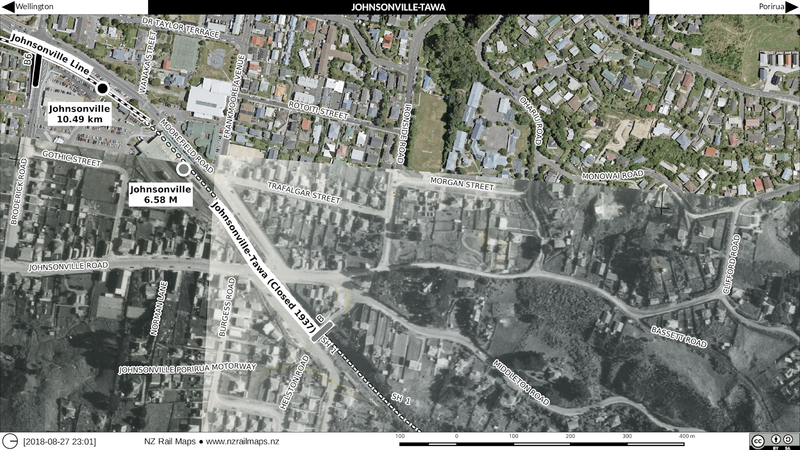 However mapping has not started because of a consideration that a day might be spent at the local Archives New Zealand office to obtain NZR diagrams for every station. I have compiled lists of all the files held and am making preliminary enquiries with ANZ Christchurch office with a view to accessing these files in order to extract the required information from them. The last few days have been spent working in one single Gimp project containing the tiles for all the stations on the Methven Branch, together. 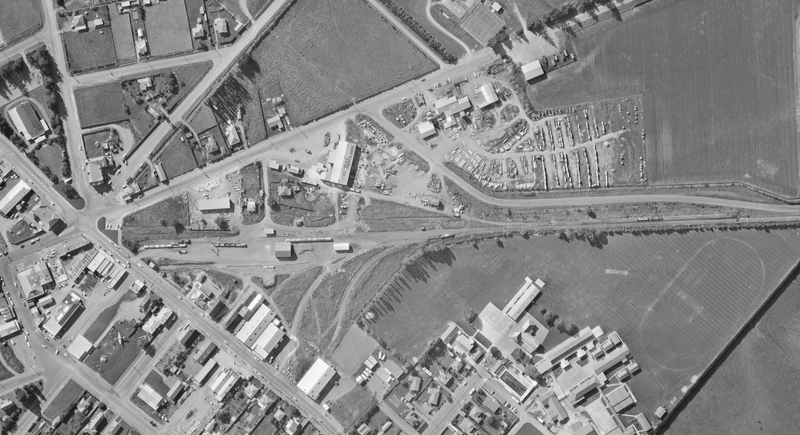 At the same time, lists of NZR files for every station have been collated to research at Christchurch Archives as the hoped for set of plans of the station layouts has not materialised. 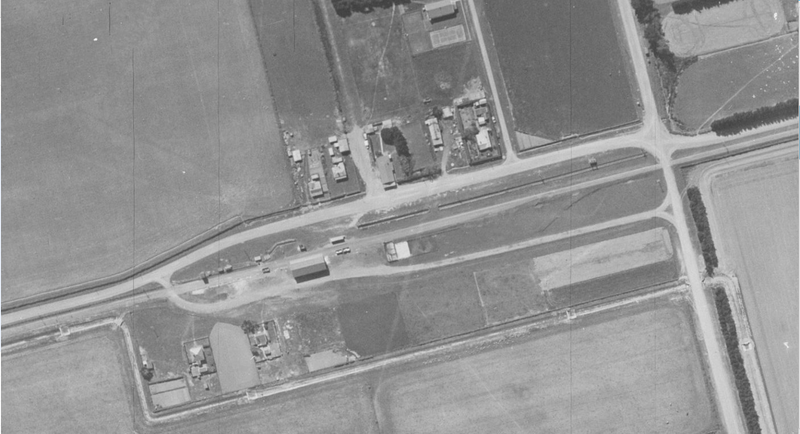 At this moment of writing I have just finished the mosaics for every station except Rakaia, which is properly a main line junction station, not on the branch itself, but for which nevertheless I have aerial photos for three eras, 1942, 1974 and 1984, and which I will shortly assemble. 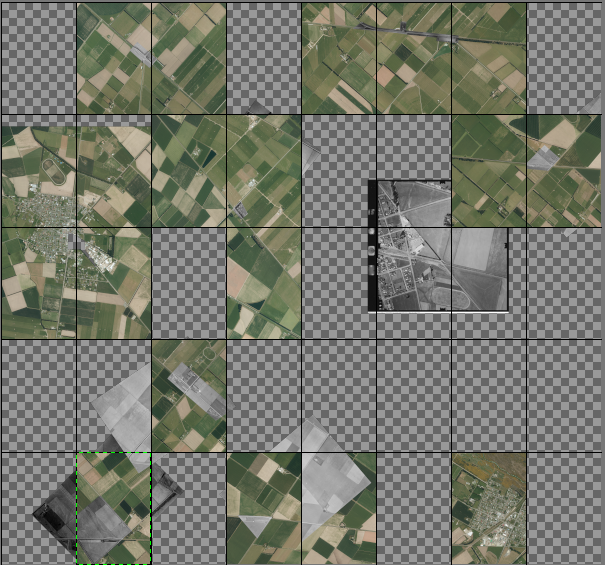 This is a screenshot for the Gimp project with all the tiles in one file. 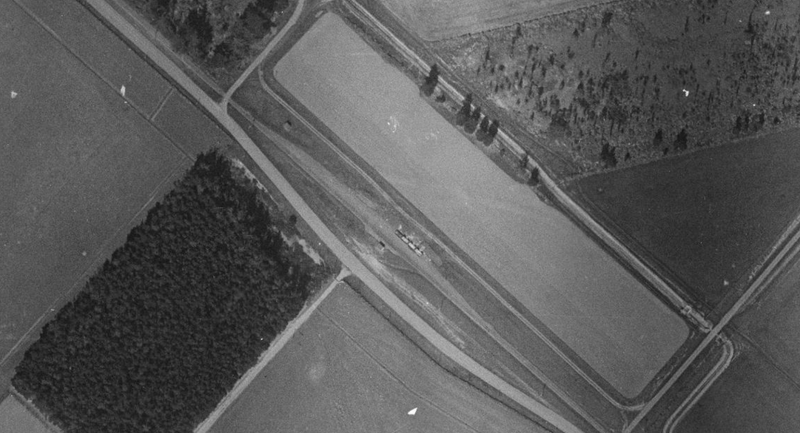 Rakaia, yet to be completed, is lower right, with one of its aerials prominently visible more or less above it. 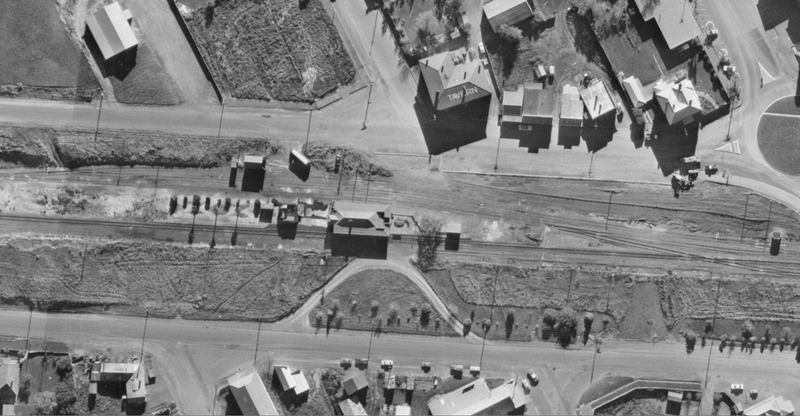 The Methven Branch was one of the few privately constructed railways in NZ and like most of them unsuccessful (the Wellington and Manawatu Railway was the only successful one). 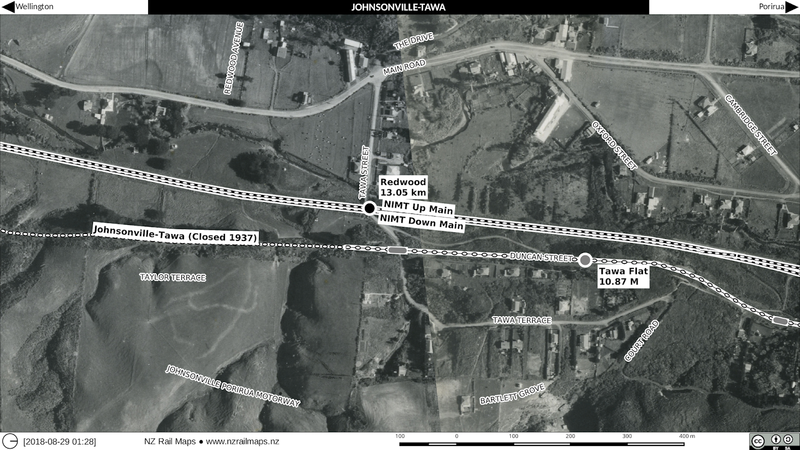 It is easy to see why when looking at the geography of the line; except for the junction and terminus, the stations along the line are tiny localities that would have struggled to produce enough freight to pay their way, and the line was only privately run for three or four years before it was bought out by the government. 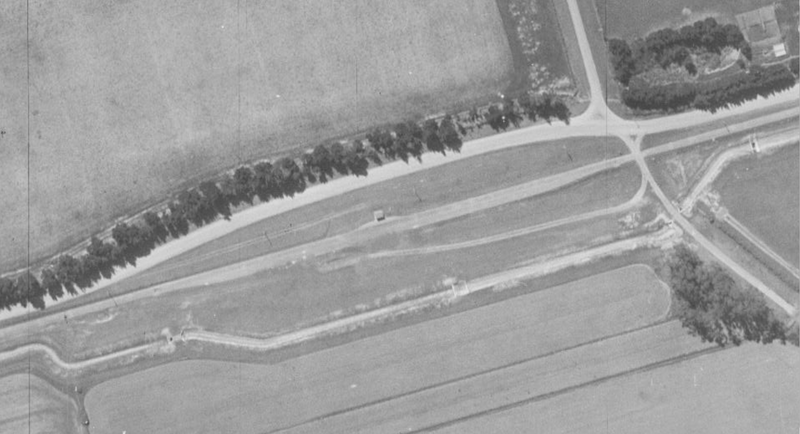 Although I have yet to conclude the layouts for any of the stations, most of the intermediate sites were almost identical with road devations, that in most cases have since closure been reverted, one of the reasons why it is difficult to locate many remains today. 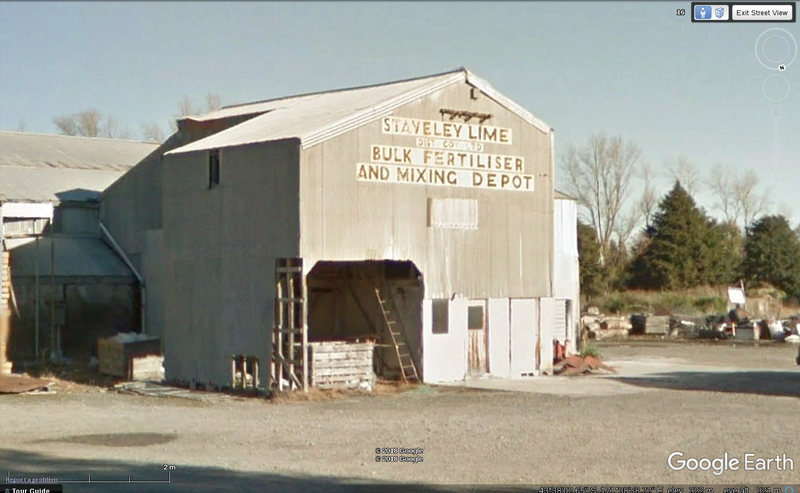 Methven has somewhat more remnants, including the "Staveley Lime" fertiliser depot shown below (which has the name of Kempthorne Prosser painted on its roof); the lime company has been out of business for decades. For this series on MSL branches the articles will be numbered by branch, hence why the first post starts at series 2. 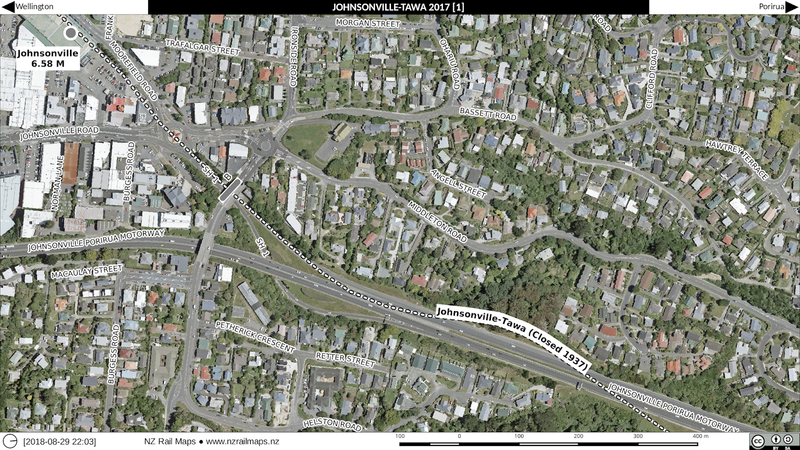 Southbridge / Little River is 1, Springburn is 3, Fairlie is 4, Waimate is 5, Kurow is 6, Ngapara / Tokarahi is 7, Dunback / Makareao is 8, Port Chalmers / Walton Park is 9, Outram is 10, Roxburgh is 11, Catlins is 12, Tapanui is 13, Waikaka is 14, Waimea Plains is 15, Glenham is 16, Bluff is 17, Seaward Bush is 18. These are the ones that are in Volume 11 - there are two obvious exceptions which are in Volume 12. 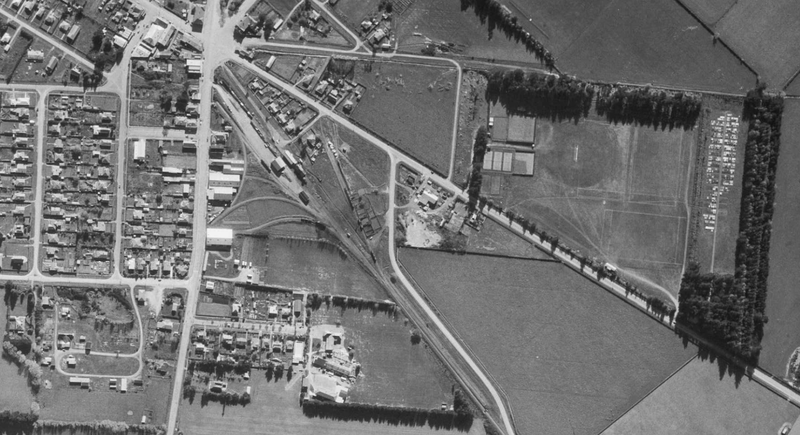 Methven 1981 (five years after closure). 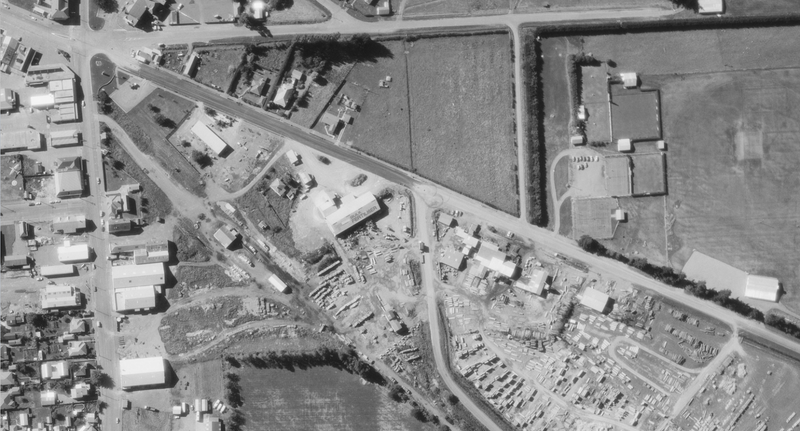 Two more of Rakaia in 1942.